Cacti can be an exciting way to spice up your backyard landscape. Many are full of unique colors and flowers with spires, curves and spiky, regal stalks to make your yard come to life. These sun-loving plants make for a very low maintenance backyard design that practically cares for itself. Check out these tips on how to pull off cactus landscaping in your backyard. Good drainage is important, as sitting in standing water can damage your cacti. Assure your run off goes into proper drainage portals, and make certain no areas will become soggy when it rains. There are wide varieties of cactus available at local nurseries and other retail garden stores. Verify the growing conditions in your area, then select your cacti according to those guidelines. Cactus can be planted at any time throughout the year. Mature cacti do not like to be moved - so be sure you choose a long-standing location appropriate for good health. Transplanting cacti is tricky, spiky and at times even a little dangerous. For the most appealing backyard design - make sure you choose an attractive border to contain your cactus landscaping. Large rounded rocks, cement blocks, small stones or bricks are commonly used for cacti garden borders. The simplest approach is to create the border using bricks or stones, then infill the area with sandy, cacti-appropriate soil. This sets ideal growing conditions and good drainage in place for the long-time health of your cactus landscaping. It's best to place these cacti areas on mounds and natural hilly areas so the raised elevation prevents them from ever sitting in standing water. This prevents root rot. Large rocks placed as a center-piece, unusual shapes and slabs, an old covered wagon or wheel, fence posts and other old west props work very well to add a southwest theme for your cactus landscaping. Choose one or two very large cacti and place them near the center of your backyard landscape design. This will act as a centerpiece. One great choice is the Saguaro, which grows slowly to a height of about 60 feet at maturity. The Saguaro will not branch off until it has reached a height of 3 feet. It blooms beautiful white flowers and lives for many years if kept healthy. Another good one is the "hairy old man" or Cleistocactus strausii. This will grow to 6 feet tall and will seasonally bloom purple-red flowers. This is a non-branching cactus that features an unusual covering of furry needles. The "tree cholla" or Opuntia imbricata is another great choice for cactus landscaping that grows into a 10-foot column and produces pink flowers. The "golden barrel" is formally called "Echinocactus grusonii" and can grow to 4 feet tall and 2.5 feet wide after many years. Younger golden barrels do not look much like the mature ones, and these cacti can grow for as long as 30 years! They have yellow flowers and grow well in warmer climates, making them a perfect option for Arizona homeowners. The Ferocactus emoryi or the "red barrel" is another option for medium sized cacti. It grows up to 8 feet with yellow-red blossoms and can make for a beautiful addition to your backyard landscape. As a tip, you can group cacti within the same genus together to create a dramatic display. For example, there are more than 30 types of cacti in the Ferocactus genus that vary in size and shape but have similar characteristics. 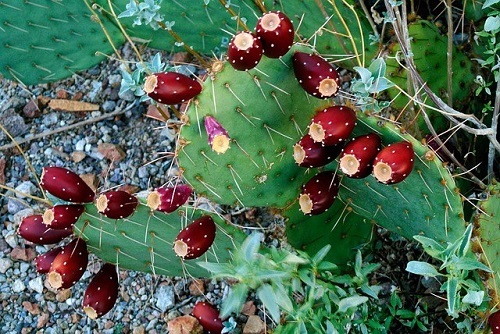 Add excitement to your cactus landscape by featuring some unusual cacti. Astrophytum myriostigma (also known as the Bishop's Cap) grows to 10 inches tall. It has yellow flowers but may take up to 6 years to begin blooming. This cactus is perfectly symmetrical and does not grow any spines. The Sand Dollar cactus (Astrophytum asterias) is another type of unique cactus that grows to a height of about eight inches. It is symmetrical and spineless and looks like a Sand Dollar from the top, hence its nickname. It is covered with pretty yellow flowers when in season. Both the Bishop's Cap and The Sand Dollar Cactus are low-growing groundcover plants, and make a great option if some areas of your yard need protection from erosion and/or drought. So there you have it, some fresh ideas on how to incorporate cacti landscaping in your yard!